We’ve been notified by the IRS agent reviewing our application for 501(c)3 Status that since we buy and sell hardware, even though none of us receive income, that we don’t qualify as a tax exempt organization. We had the option of no longer buying and reselling, but our board unanimously decided that was central to our goal of reducing barriers to renewable energy and making systems affordable to as many people, as quickly as possible. So we will technically be a “for profit organization” but will keep our prices as low as possible while maintaining our organization as a member owned and controlled cooperative. Many of our members are interested in protecting their power supply against this winter’s ice, so we are beginning to review our options for power storage. We need to define the highest value periods we want energy storage to cover, and as the price of storage falls, increase the individual home’s storage capacity to grid independence, and then beyond perhaps to actually exporting excess capacity for a profit. The logical steps would be: solar only grid > connect with normal peak load storage > solar with critical peak load storage > net zero > exporting higher levels of excess energy. The economics for each steps will shift as the price of storage continues to drop and the cost of utility power increases. For PV to gain credibility within the utility industry and the KCC, we first need to show that solar competes with Kansas utility generation at the time of its highest value… peak load which from Southwest Power Pool data begins at 11:00 AM and runs until 7:00 PM on weekdays from May through August. But more than that the very highest period is during the fifteen hottest “critical peak” days. This period determines the capacity of all the infrastructure a utility mandated to build in both generating and delivering power to customers. This is the question the Kansas Corporation Commission is judging at this moment. Power storage is the answer. In case you missed it over the holiday, Congress passed a new federal budget, notably extending tax credits for solar, wind, and other renewable energy technologies. The extension differs from previous ones in two ways: it extends the credits for multiple years but also (as ILSR has been discussing since 2012) phases them out over time. In other words, while the expiration of the solar tax credit wasn't doomsday (and even had a few silver linings), Congress came up with a reasonable compromise to maintain incentive parity between clean energy and fossil fuels and provide the energy market with several years of predictable policy. Extensions with a Phase Out over time. In other words, while the expiration of the solar tax credit wasn't doomsday (and even had a few silver linings), Congress came up with a reasonable compromise to maintain incentive parity between clean energy and fossil fuels and provide the energy market with several years of predictable policy. 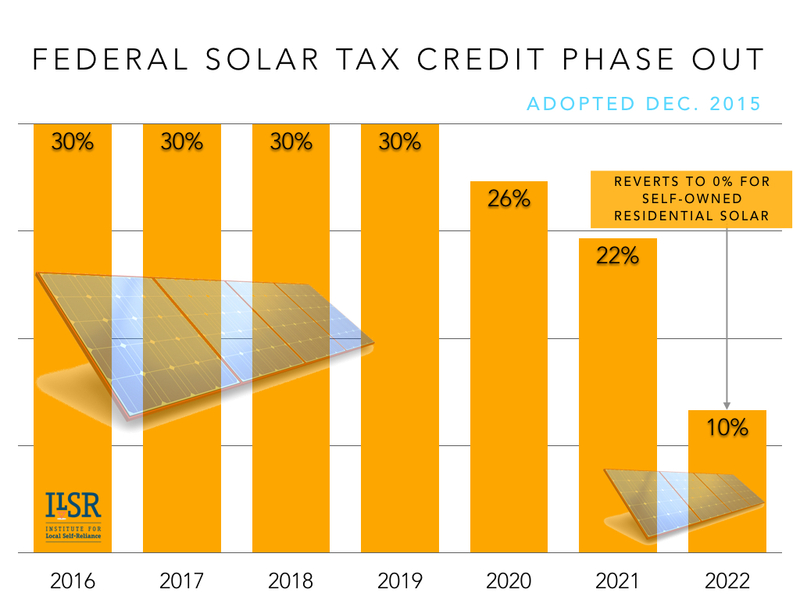 Solar tax credit was similarly extended, but with no decrease through 2019, and a phase out beginning in 2020. The language of the credit also shifted the deadline from "in service" to "commencing construction," giving projects more time to access the full credit. The following chart illustrates the tax credit decrease after 2019, from 30% down to 10% (or 0% for solar projects on residential property owned by the resident). 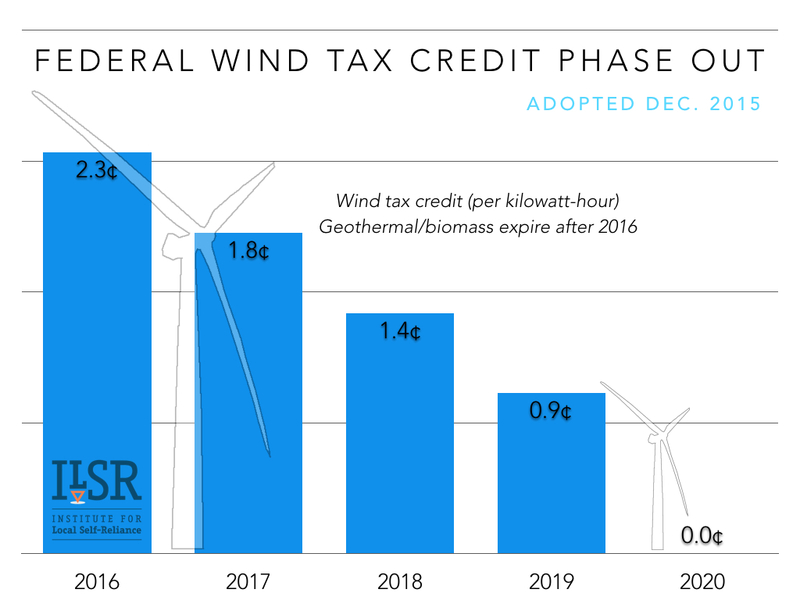 The upside of the tax credit extension is obvious: continuing to make the cost renewable energy favorable relative to the cost of fossil fuel power generation. The downside is that the tax credit remains a lousy way to incentivize renewable energy in an equitable manner, favoring Wall Street participation over Main Street. And promising tools for reducing the cost of financing clean energy may have to wait while the tax credit crowd continues their dominance over clean energy financing. Finally, while the phase out is smart policy design, it also raises the specter of parity: will fossil fuel subsidies be similarly reduced as clean energy incentives are reduced? At the end of the day, discounts for clean energy are a good thing, and this extension is worth cheering. But we hope that as the market matures, Congress will look for ways to give more ordinary Americans a way to buy into our clean energy future, whether they have tax liability or not. John Farrell is the Director of Democratic Energy at the Institute for Local Self-Reliance and widely known as the guru of distributed energy. John is best known for his vivid illustrations of the economic and environmental benefits of local ownership of decentralized renewable energy. Highly recommended. We still have a dozen Canadian Solar 260W modules with Enphase 215 inverters in our warehouse, so if you are interested yet this winter…they are available.